CALLAHEAD works continuously to provide you with new products, options & services. We are committed to supplying you with the best portable units available. Perfecting yet another one of our own creations, CALLAHEAD introduces The Personal Portashed. Designed & fabricated much like CALLAHEAD’s Portashed 48 & Portashed 25, The Personal Portashed is made to accommodate your individual needs. The Personal Portashed is produced from only the highest quality products, with strong & durable aluminum & fiberglass construction built to last a lifetime. Complete with heat, lights & electric, the Personal Portashed exceeds any and all expectations required of a utility storage unit. Its all gel-coat fiberglass & aluminum surfaces make for easy cleaning with absolutely no corrosion, and its bright white color gives off a spacious, clean feeling. The Personal Portashed is topped with a single mold fiberglass roof, creating a completely weather tight shed. The Personal Portashed keeps your expensive tools and equipment closest to where you need them, while keeping them perfectly stored & secured. The Personal Portashed comes fully equipped with a commercial steel fireproof door & a 5-point CALLAHEAD locking system, offering maximum protection for your valuable assets. For your convenience, with just one quick phone call, The Personal Portashed can be easily relocated & can follow the workers as the project progresses. 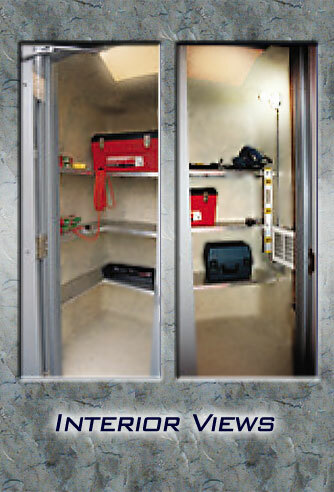 When you need secure, portable & personal storage, The Personal Portashed is the ideal solution. Work sites are a reflection on your company & are seen by customers, inspectors & the general public. A work site with CALLAHEAD products on it will enhance your company’s image. Rely on the company who provides only the best: CALLAHEAD! DOOR OPENING - 28" X 71"